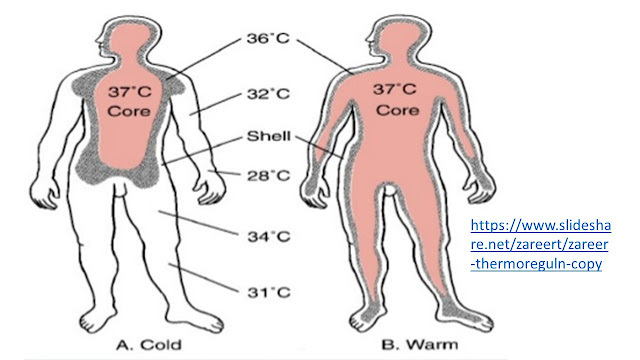 We are endotherms (warm-blooded animals) and must maintain a nearly constant temperature (~37C) of blood (the core body temperature) circulating to the vital organs like brain, heart, liver and kidneys. Most of the heat loss happens from the skin which is held at a slightly lower temperature of 33C to 34C. Mild hypothermia is defined when core body temperature falls to 35C but serious complications occur if the blood temperature drops further. 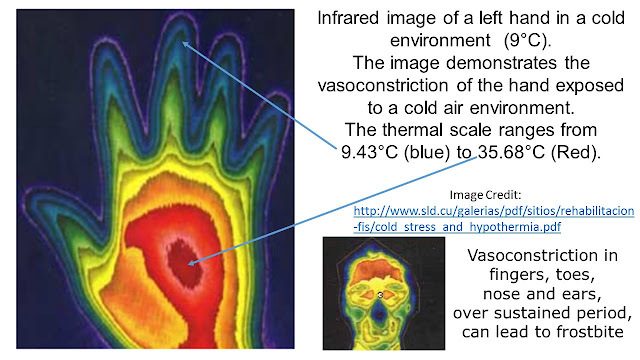 In hypothermia, skin temperature particularly at the extremities is much lower. 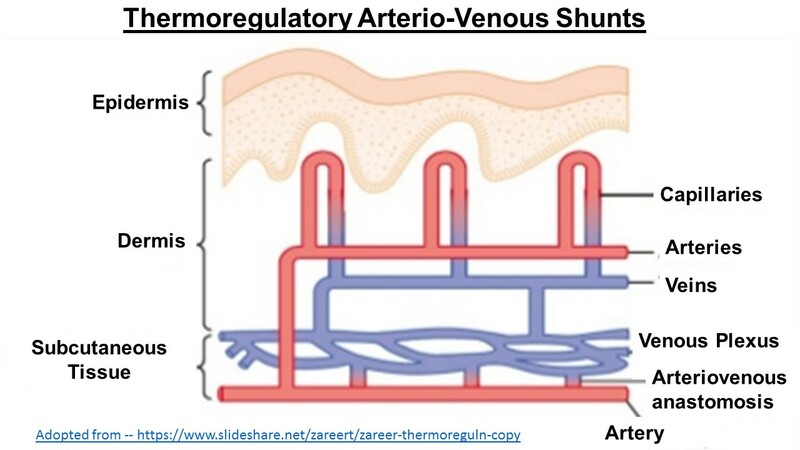 It can be almost as low as the ambient temperature with extremities receiving very little blood flow (vasoconstriction). b. Muscle activity - exercise etc. c. Evaporation of water (the sweat) on the skin by moving air. The question we address in this blog is what happens when the ambient temperature is much lower than 23C. Heat loss by radiation increases rapidly at lower ambient temperatures and easily exceeds heat production to cause hypothermia. At the onset of hypothermia, as a first response, the body starts shivering - an involuntary oscillatory muscular activity that produces additional heat energy to warm the body. Mild Hypothermia: This results in symptoms such as shivering, numbness in hands and other extremities and reduced manual dexterity. Complex skills become more difficult, the victim may also feel tired, may argue and become uncooperative. Difficulty in performing tasks such as fastening up clothing, putting on gloves, a hat etc. or taking them out of a rucksack may result in the victim getting irritated and ending up not bothering. This will of course make them get even colder. The final stage is profound hypothermia: In this stage the body has effectively stopped trying to keep itself warm and some final steps are taken to avoid death. The heart rate and breathing slow so that they are hard to detect at all. Only one or two breaths per minute may be taken. The skin is very pale and icy cold to the touch. Metabolism has slowed so far that they are almost in a state of hibernation. At a core temperature of around 28°C heartbeat irregularities may occur - called cardiac arrhythmias - this can lead to an uncoordinated twitching of the heart muscle preventing it from pumping blood properly and can result in death. Even if this does not happen, the heart will stop beating completely at around 20°C causing death. When Thermoregulatory system is unable to cope: If someone is exposed to cold and inadequately protected, their body will first try to generate more heat through shivering to maintain a normal temperature. If this does not solve the problem, the body will start decreasing blood flow to the extremities to curtail heat loss. Extremities will turn cold and appear blue. If the loss of heat carries on despite these measures, in the final stages the body will slow its metabolism to minimize its need for fresh blood flow and oxygen supply. Actually, the sooner the body reaches this final step, better is the chance of survival as the organs won't be starved of oxygen. The Physics of Heat Loss from the Skin: I now look at the physics of heat loss by the skin. 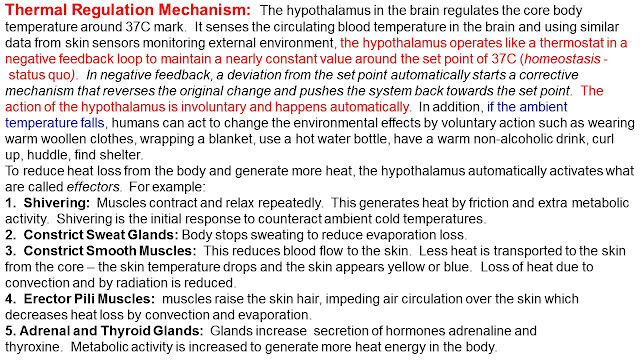 In hypothermia, the main mechanism of heat loss is by radiation. The body has effectively switched off convection (vasoconstriction makes exposed extremities much colder, thereby reducing heat loss, also one wears woolen clothes to reduce air flow across the skin) and evaporation (switch off sweating). The net heat energy loss increases with decreasing ambient temperature; even at outside temperature of 15C, energy lost is greater than the heat generated by the calories consumed. The above calculation actually overestimates the heat loss - the skin temperature falls below 33C as hypothermia sets in and the heat loss by radiation is reduced. 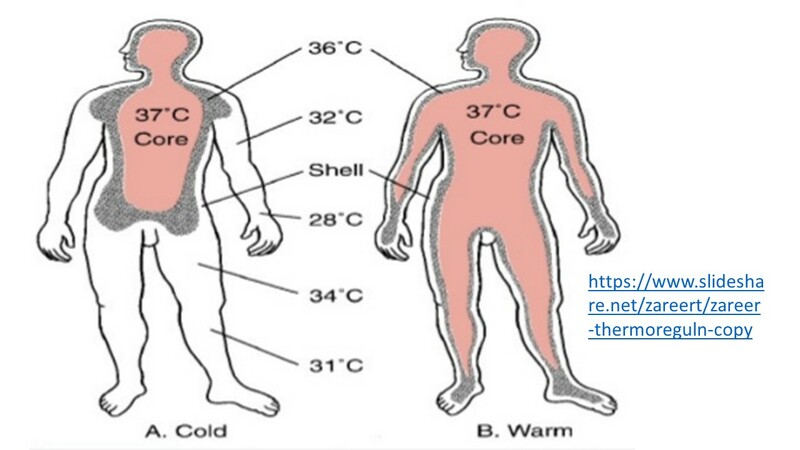 Considering an average skin temperature of 23C (extremities may be much colder but rest of the body will still be near 30C) and an ambient temperature of 0C (not uncommon during winter months), radiation heat loss will still be about 230W - too large for the body to compensate through thermo-regulatory mechanisms. Convection: is transfer of heat between our skin and the surrounding air. How much heat energy is lost from the skin depends on the temperature difference between skin and surrounding air; it also strongly depends on whether the air is still or moving. K is convection coefficient and its value depends on the speed of air - the largest difference being between still air and moving air. The way it works is that our body warms a thin layer of air next to the skin. This boundary layer acts as an efficient insulation reducing heat loss. In convection, wind blows this boundary layer away and heat from the skin creates another boundary layer. As wind continues to blow away such boundary layers, body looses heat energy and cools. For a 5 degree difference in temperature, power loss is about 20 W in still air, but increases to 200 W in moving air! Convection is a very efficient method of heat transfer when there is a breeze present. On a cold day, if you are indoors and properly clothed then heat loss by convection is not significant. Outdoors with wind blowing is a different matter, and one can lose additional heat due to convection - the ambient temperature will feel much colder - this is called the wind chill factor that I discuss next. Wind Chill and Frostbite: When outdoors, on a cold day, one feels that the temperature is lower than its actual value. This is due to the combined effect of heat loss by radiation (indoors and/or outdoors) and convection (important when outdoors in the wind). The wind chill factor (or wind chill temperature) is a measure of how it feels when the effect of convection due to wind is included. It feels that the temperature is lower than the thermometer value. Note that your body temperature can never fall below the actual temperature even in windy conditions - only difference is that the body cools quicker when the wind speed is higher. Frostbite happens when the body organ actually freezes (temperature falls below about -5C for an extended period). 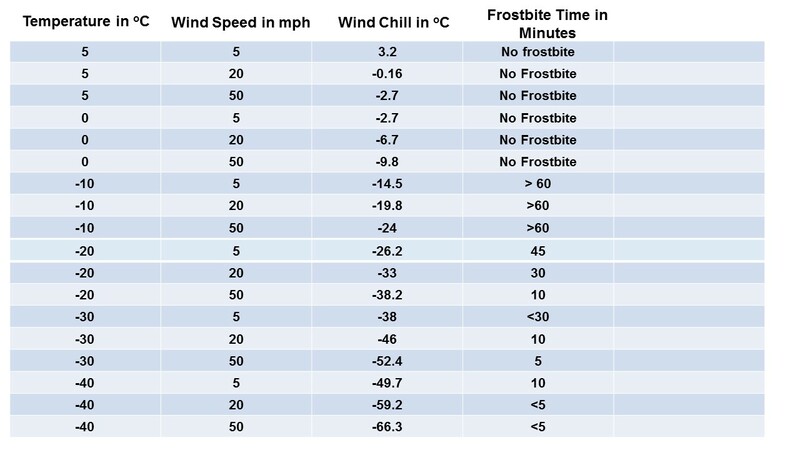 Notice that even mild wind speeds cause serious wind chill. 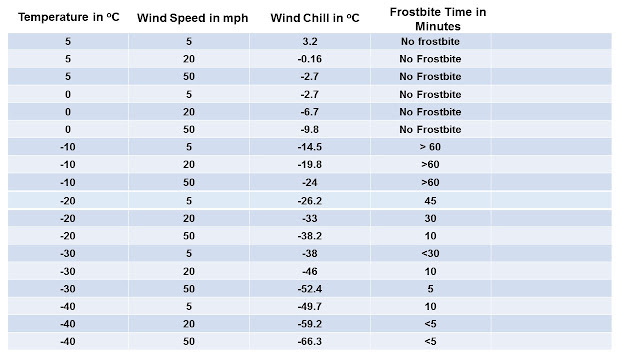 For example - At a temperature of -20C, wind chill is -26.2C for wind at 5 mph; -33C at 20 mph and -38.2C at 50 mph. This is because the heated boundary layer at the skins is swept away by even modest wind speeds and further increases in wind speed do not make a proportionate effect. Frostbite mainly affects organs at the periphery that experience vasoconstriction (narrowing of the blood vessels) and do not receive much heat energy from the core of the body. Below about -5C, freezing causes ice crystals to form in the tissue. Ice crystals can damage cell membrane and small blood vessels in the frozen tissue. I remember when I was living in Saskatoon, Canada, the advice was never to walk outside for more than 10 minutes as the ambient temperatures would go down to -44C in winter months! Most at risk of frostbite are people who are away from sheltered places - out in the open; e.g. military personnel, homeless people, sports enthusiasts. Alcohol beverages cause your body to lose heat faster. Management of frostbite is a complex subject - please click here for more details. 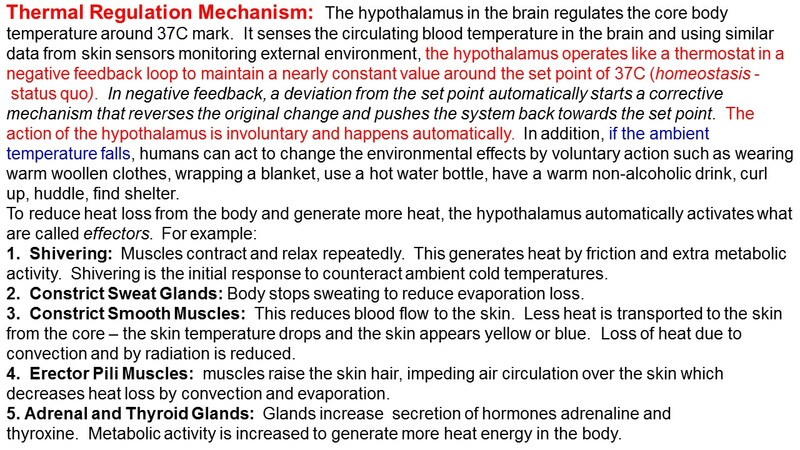 End Note: Human body maintains a state of homeostasis - parameters like core body temperature, blood sugar level, blood pressure and many more, are regulated in a narrow range by the hypothalamus in a negative feedback mode. Hypothalamus does a wonderful job but it has its limits beyond which the regulatory mechanisms cannot cope. Human body produces 100W by metabolizing the food we eat (click here). The regulation of temperature fails when the ambient temperature is too high (click here) or too low (covered in this blog) - this can be life threatening. The science is well understood but the responsibility of keeping oneself safe rests with the individual. Finally, there are a couple of YouTube Videos (1, 2) which might be worth watching.